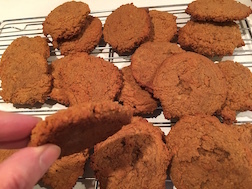 Paleo (with eggs) OR Plant Based - Gluten & Wheat Free! * Set out butter & cream cheese several hours before using to soften, OR warm in oven or on the stovetop (be careful to use extremely low heat so the cream cheese does not coagulate) until soft. * Plant Based: Use 4 Tlbs Arrowroot, Potato or Tapioca Flour instead of eggs:add this flour to other dry ingredients! Adding ginger, cinnamon and nutmeg. Whip eggs (if Paleo) in a separate medium-sized bowl - fold in butter/cream cheese. Lightly beat mixtures until well blended. Add anise & orange oils - stir in vanilla & milk - blend well with mixer or food processor. 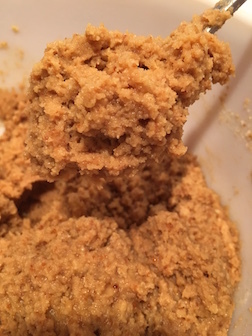 Pour wet mixture into dry ingredients and using a hand mixer or food processor, blend well until ingredients are smooth and form a soft cookie batter. * IF Plant Based, allow batter to ‘rest’ for 10 minutes. 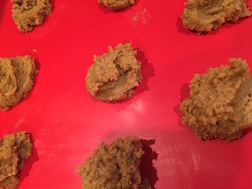 Spoon onto non-stick baking sheet or parchment lined cookie sheet using about 2 Tlbs batter for each cookie. Keep these smaller for a more uniform texture. IMPORTANT! BAKE: 345* FOR 10 mins THEN remove from oven and using the bottom of a large food-safe mug or glass, press down lightly to flatten to desired thickness. Return to oven for another 8-10 minutes. Remove to cooling racks. Watch them disappear! Makes 24 Cookies. YUM! Thank You for Your Prayers, Gifts & Donations to With One Accord Ministries! We are an accountable, faith-based KJV ministry and with our Friends and Partners we are reaching the world with a message of Yahushua's Salvation, healing and deliverance! Bless You!